Our Little Paris is a One Bedroom Apartment with a Queen size bed. On the top floors of "The Sheraton Hotel", our self contain apartments offers full kitchen, dining and lounge, and a welcome amenity pack. Being in the heart of Melbourne CBD, we are close to Shopping and Cafes. It is the perfect place to be for your business stay or to explore Melbourne. Standard rate is for two guests with a minimum 14 nights stay. Our Little Paris is a One Bedroom Apartment with a Queen size bed. On the top floors of "The Sheraton Hotel", our self contain apartments offers full kitchen, dining and lounge, and a welcome amenity pack. Being in the heart of Melbourne CBD, we are close to Shopping and Cafes. It is the perfect place to be for your business stay or to explore Melbourne. Standard rate is for two guests with a minimum 7 nights stay. Our Little Paris is a One Bedroom Apartment with a Queen size bed. On the top floors of "The Sheraton Hotel", our self contain apartments offers full kitchen, dining and lounge, and a welcome amenity pack. Being in the heart of Melbourne CBD, we are close to Shopping and Cafes. It is the perfect place to be for your business stay or to explore Melbourne. Standard rate is for two guests with a minimum 5 nights stay. Paris Paris is a Two Bedroom One Bathroom Apartment with 2 Queen Size bed, one in each bedroom. On the top floors of "The Sheraton Hotel", our self contain apartments offers full kitchen, dining and lounge, and a welcome amenity pack. Being in the heart of Melbourne CBD, we are close to Shopping and Cafes. It is the perfect place to be for your business stay or to explore Melbourne. Standard rate is for two guests with a minimum 14 nights stay. Our Little Paris is a One Bedroom Apartment with a Queen size bed. On the top floors of "The Sheraton Hotel", our self contain apartments offers full kitchen, dining and lounge, and a welcome amenity pack. Being in the heart of Melbourne CBD, we are close to Shopping and Cafes. It is the perfect place to be for your business stay or to explore Melbourne. Standard rate is for two guests with a minimum 3 nights stay. Paris Paris is a Two Bedroom One Bathroom Apartment with 2 Queen Size bed, one in each bedroom. On the top floors of "The Sheraton Hotel", our self contain apartments offers full kitchen, dining and lounge, and a welcome amenity pack. Being in the heart of Melbourne CBD, we are close to Shopping and Cafes. It is the perfect place to be for your business stay or to explore Melbourne. Standard rate is for two guests with a minimum 7 nights stay. Paris Supreme is a Two Bedroom Two Bathroom Apartment with 2 Queen size beds, one in each bedroom. On the top floors of "The Sheraton Hotel", our self contain apartments offers full kitchen, dining and lounge, and a welcome amenity pack. Being in the heart of Melbourne CBD, we are close to Shopping and Cafes. It is the perfect place to be for your business stay or to explore Melbourne. Standard rate is for four guests with a minimum 14 nights stay. Our Little Paris is a One Bedroom Apartment with a Queen size bed. On the top floors of "The Sheraton Hotel", our self contain apartments offers full kitchen, dining and lounge, and a welcome amenity pack. Being in the heart of Melbourne CBD, we are close to Shopping and Cafes. It is the perfect place to be for your business stay or to explore Melbourne. Standard rate is for two guests with a minimum 2 nights stay. Paris Paris is a Two Bedroom One Bathroom Apartment with 2 Queen Size bed, one in each bedroom. On the top floors of "The Sheraton Hotel", our self contain apartments offers full kitchen, dining and lounge, and a welcome amenity pack. Being in the heart of Melbourne CBD, we are close to Shopping and Cafes. It is the perfect place to be for your business stay or to explore Melbourne. Standard rate is for two guests with a minimum 5 nights stay. Paris Supreme is a Two Bedroom Two Bathroom Apartment with 2 Queen size beds, one in each bedroom. On the top floors of "The Sheraton Hotel", our self contain apartments offers full kitchen, dining and lounge, and a welcome amenity pack. Being in the heart of Melbourne CBD, we are close to Shopping and Cafes. It is the perfect place to be for your business stay or to explore Melbourne. Standard rate is for four guests with a minimum 7 nights stay. Our Little Paris is a One Bedroom Apartment with a Queen size bed. On the top floors of "The Sheraton Hotel", our self contain apartments offers full kitchen, dining and lounge, and a welcome amenity pack. Being in the heart of Melbourne CBD, we are close to Shopping and Cafes. It is the perfect place to be for your business stay or to explore Melbourne. Standard rate is for two guests. Paris Paris is a Two Bedroom One Bathroom Apartment with 2 Queen Size bed, one in each bedroom. On the top floors of "The Sheraton Hotel", our self contain apartments offers full kitchen, dining and lounge, and a welcome amenity pack. Being in the heart of Melbourne CBD, we are close to Shopping and Cafes. It is the perfect place to be for your business stay or to explore Melbourne. Standard rate is for two guests with a minimum 3 nights stay. Paris Supreme is a Two Bedroom Two Bathroom Apartment with 2 Queen size beds, one in each bedroom. On the top floors of "The Sheraton Hotel", our self contain apartments offers full kitchen, dining and lounge, and a welcome amenity pack. Being in the heart of Melbourne CBD, we are close to Shopping and Cafes. It is the perfect place to be for your business stay or to explore Melbourne. Standard rate is for four guests with a minimum 5 nights stay. Paris Paris is a Two Bedroom One Bathroom Apartment with 2 Queen Size bed, one in each bedroom. On the top floors of "The Sheraton Hotel", our self contain apartments offers full kitchen, dining and lounge, and a welcome amenity pack. Being in the heart of Melbourne CBD, we are close to Shopping and Cafes. It is the perfect place to be for your business stay or to explore Melbourne. Standard rate is for two guests with a minimum 2 nights stay. Paris Supreme is a Two Bedroom Two Bathroom Apartment with 2 Queen size beds, one in each bedroom. On the top floors of "The Sheraton Hotel", our self contain apartments offers full kitchen, dining and lounge, and a welcome amenity pack. Being in the heart of Melbourne CBD, we are close to Shopping and Cafes. It is the perfect place to be for your business stay or to explore Melbourne. Standard rate is for four guests with a minimum 3 nights stay. Paris Supreme is a Two Bedroom Two Bathroom Apartment with 2 Queen size beds, one in each bedroom. On the top floors of "The Sheraton Hotel", our self contain apartments offers full kitchen, dining and lounge, and a welcome amenity pack. Being in the heart of Melbourne CBD, we are close to Shopping and Cafes. It is the perfect place to be for your business stay or to explore Melbourne. Standard rate is for four guests with a minimum 2 nights stay. Paris Paris is a Two Bedroom One Bathroom Apartment with 2 Queen Size bed, one in each bedroom. On the top floors of "The Sheraton Hotel", our self contain apartments offers full kitchen, dining and lounge, and a welcome amenity pack. Being in the heart of Melbourne CBD, we are close to Shopping and Cafes. It is the perfect place to be for your business stay or to explore Melbourne. Standard rate is for two guests. Paris Supreme is a Two Bedroom Two Bathroom Apartment with 2 Queen size beds, one in each bedroom. On the top floors of "The Sheraton Hotel", our self contain apartments offers full kitchen, dining and lounge, and a welcome amenity pack. Being in the heart of Melbourne CBD, we are close to Shopping and Cafes. It is the perfect place to be for your business stay or to explore Melbourne. Standard rate is for four guests. Our neighbourhood has it all. We’re located at the Paris end of the Central Business District, offering easy access to dynamic shopping, nightlife, and sporting venues, including the Melbourne Cricket Ground (MCG). The city’s cultural attractions are easily accessible via transport options close to the Apartments Melbourne Domain. We are also conveniently near numerous commercial offices. services of our Business Centre. 1. The registered guest agrees that he/she is fully responsible for any additional occupants and/or visitors to the apartment for the duration of the occupancy. 3. The guest agrees to comply with all body corporate rules pertaining to the apartment. A full breakdown of all body corporate rules is located in the Apartments Melbourne Domain compendium found in the apartment. The guest agrees to read these rules and conditions in full and abide to the terms of these rules and conditions. Should the guest be found in breach of any body corporate rule or regulation, the guest may be requested to vacate the property and any charges relating to the damage, loss of income, legal fees, etc. 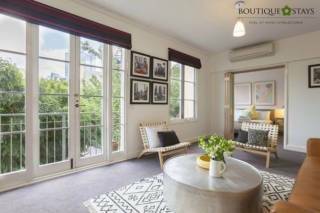 borne by Apartments Melbourne Domain may be charged to the guest. Such charges may be automatically drawn from the security deposit without prior notification. 4. In the interest of yourself, other guests and residents Apartments Melbourne Domain has a strict NO PARTY OR EXCESSIVE NOISE POLICY, NO SMOKING POLICY & NO PETS POLICY. Should a guest be found breaching any of these policies, they will be asked to leave the premises regardless of what time the incident has occurred. 6. Security is available 24/7 to respond to noise, bad behaviour or undesirable activities. If you or your guests are found to be breaking Terms and Conditions in particular excessive noise, you will be charged a $200 security call out fee for each response. If the warnings are not followed and security attends your apartment 3 times you will be immediately evicted. 7. Apartments Melbourne Domain is not responsible for any valuables left in the apartment or within a vehicle on the premises and is done so at the guests own risk. 8. Unless a late checkout has been arranged, the checkout time is 10:00am on the day of departure. 9. Immediately upon checking out, the guest must return all keys provided to Apartments Melbourne Domain at the designated key drop off location. Failure to return the keys immediately upon check out may result in the replacement cost of the keys and the changing of the locks charged at cost to the guest. 10. Internet is available for $17 per 24 hours which allows 500mb of data. A 4 GB recharge can be activated for additional $30 over an above the daily $17 rate. PLEASE ARRANGE PRIOR TO OR REQUEST NOW. 11. Parking is available offsite at Wilsons Parking, located across the road from The Sheraton Hotel. It is $59 on weekdays per day, and a flat rate of $8 per day (per exit) on weekends, commencing from Friday night after 6pm. TO SECURE YOUR BOOKING A FULL PAYMENT WILL BE REQUIRED. A VALID CREDIT CARD AND PHOTO ID IS REQUIRED AT CHECK IN. A PRE-AUTHORISATION TRANSACTION PROCESSED ON A CREDIT CARD IN AN AMOUNT UP TO $500 AND WILL BE HELD AS A BOND.